What do you do when you have picked 30 pounds (13.5kg) of plums at your friend’s place? You leave 15 pounds for her to deal with and take the rest home to begin on chutney, jam, cakes, jam, liqueur, jam, and then you consider force feeding the rest to your family. Anything to use them up fast. I have mentioned my friend Andrea’s garden before and I must say that once again I was overwhelmed by it. I don’ t know if her house is built on a fertile viking worshiping ground or what, but this place is insane. Actually, I was the one who looked insane because as I stood there with my already full bags after only 30 minutes I realized I hadn’t even made a dent in what there was to pick. I couldn’t help but start laughing. When I mentioned I was disappointed I couldn’t reach the small purple plums way up in a corner treetop, Andrea pointed out that the entire back ‘wall’ of her garden is lined with the same hedge-like plum trees and there were oodles of little purple balls dangling along a 40 foot (12 meter) stretch. It is no exaggeration when I say that one of her trees has plums hanging en masse like grapes. But this is like one of those ‘big fish’ stories because I forgot to take my camera with me so I didn’t get any photos of the plums still on the branches. (Note to self, glue your camera to your person). There are four different kinds of plum trees in her yard. There were five but one of the trees blew down in a recent storm. And that one was supposed to be the big producer. 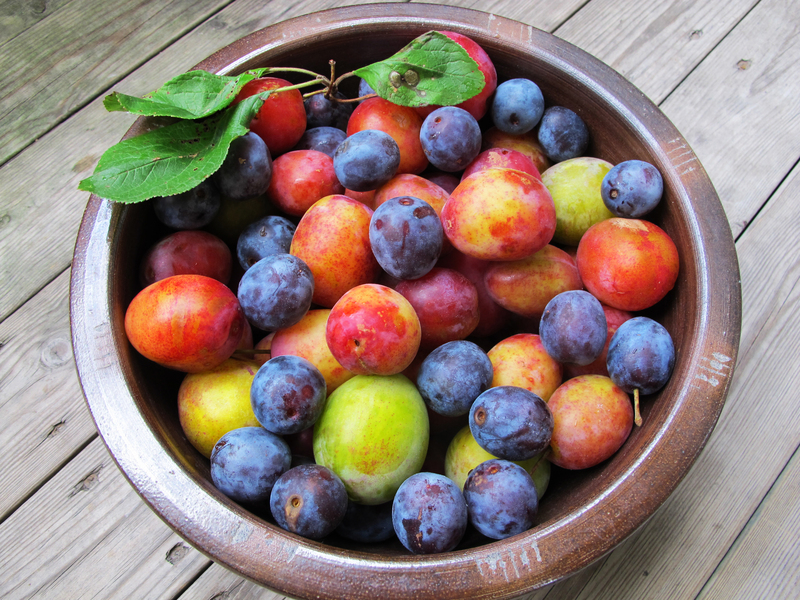 I don’t know what the remaining varieties are but there are the small purple plums, regular sized red plums, green plums with a tinge of red and yellow plums although their season seemed to be over already. When I got home and realized I had 15 pounds (nearly 7kg) of plums to use up I got to work quickly. 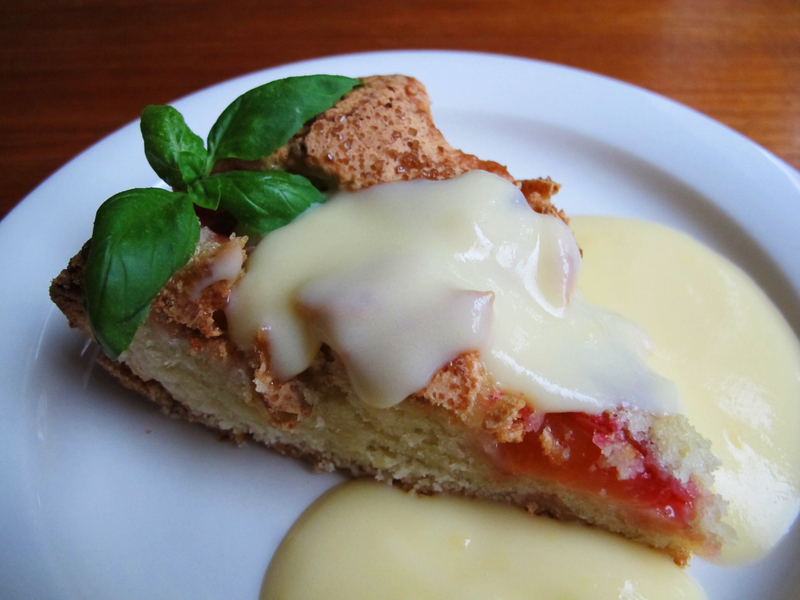 The first mission was a recipe from my mother-in-law for a plum cake (plommonkaka). Twenty five years ago she got the recipe from her neighbor, Joel, who had an amazing plum tree by the sea. Every year he would share the bountiful harvest with his friends and neighbors and he shared this recipe too. 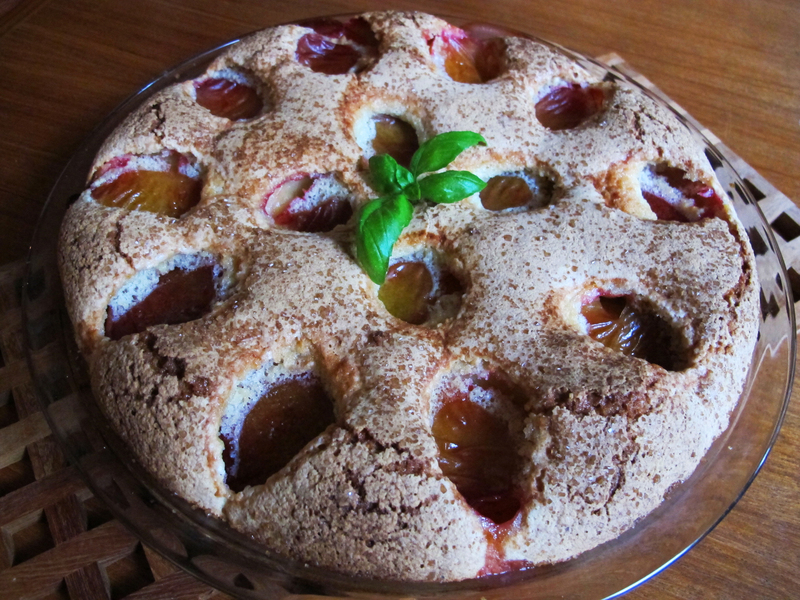 It’s a very simple cake to make and has the classic combination of almond and plums. The sweetness of the sugary cake is balanced by the tart plums and the ground almonds lend a subtle base. In Sweden it would typically be served with vaniljsås (vanilla sauce). Beat the eggs and granulated sugar together until fluffy and lemon colored. Add the melted butter, flour, baking powder, and ground almonds. Mix on low speed until well incorporated. Pour into a buttered 9″ baking dish. Top with halved plums, skin side up. Sprinkle with demerara sugar and lemon juice. Bake at 350°F (175°C) for 40-50 minutes or until a toothpick comes out clean. Serve the cake on it’s own or with vanilla ice cream or vanilla sauce. *In Sweden many people use a special mandelkvarn (almond grinder) to grind the almonds. They don’t need to be as fine as flour. To grind almonds you can blitz them briefly in a clean coffee or nut grinder watching them carefully to avoid making almond butter. Adding a little bit of sugar can help to keep the nuts from binding up while blitzing them. You could alternately use the thinly sliced almonds and chop them very finely. Me and my girlfriend picked around 12-13 kg of plums this summer too. We made chutney (lots of it) and muffins. This recipe looks amazing by the way. Just the way it is presented looks so enticing. Is “plum tuckered out” a common expression in Sweden as it is in the United States? Do you know its origin? It’s not a common expression in Sweden. What I could find about the origin was this link. No worries. I’m happy to come back. Thanks again for sharing your great garden. Hi! Just found your blog by accident through google. Speaking about plums, another smaller member of the genus Prunus also ripens in the autumn and much like the plum, lends itself to a number of recipes. I’m talking about sloe berries. Slånbär in Swedish. They grow in the wild, and like weed, in some parts of southern Sweden. I don’t know about Malmö though… But, if you’re lucky you might be able to find a bush somewhere. They should still be good for picking, since this autumn has been unusually un-autumny, especially in Skåne (although, there is nothing unusual about that). If you do find them there is one recipe that you should definitely try out. Slånbärssaft. Sloe berry squash. It’s probably my favourite kind of saft.